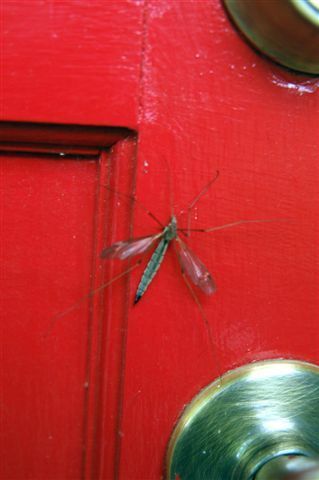 Scientific Name: Order Diptera, family Tipulidae, Tipula spp. Size: Adult--1/2 to 1", larva--3/4"
Identification: Adults are long-legged black, brown, or gray flies with long thin bodies and wings. Legs are very long and thin and broken off easily. Biology and Life Cycle: Adult flies lay eggs in the soil or in debris. Larvae, called leather jackets, are common in partially aquatic or very moist soil. Adults live only a few days. Habitat: Commonly found near water and in tall vegetation. Larvae are aquatic semi-aquatic. Feeding Habits: Larval food includes decaying plant material, fungi, moss, and rotting organic matter. Adults probably do not eat or bite, just mate. Economic Importance: Adults seem to have very little importance other than mating and looking interesting. Larvae can mess up bonsai plant soil and other potted plants. Natural Control: Cut back on the watering of container plants. Organic Control: Neem, citrus oil products, or beneficial nematodes. 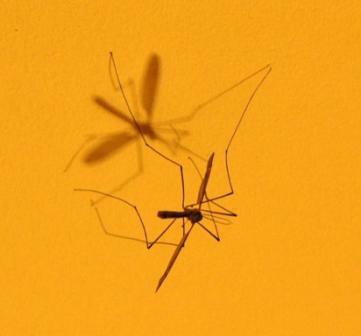 Insight: At first glance, you think the crane fly is a giant mosquito. Some people call it a Texas mosquito. Thank God it doesn't bite! 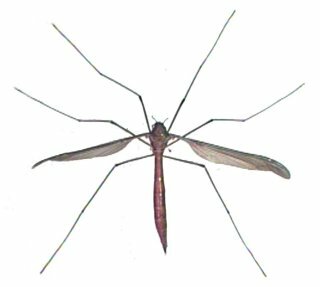 Because of its extra long legs and narrow wings, it is a clumsy flyer. The larval stage is a maggot with the head so poorly developed it almost looks headless. The skin is tough, thus the name leather-jacket. When the adult is ready to emerge, the whole pupa case pushes up out of the soil about a half-inch. The case splits open on top, and in about five to eight minutes the adult escapes. The adults have no apparent economic importance. The larvae prefer wet soils, will eat roots, and have been known to cause problems to bonsai plants. A friend had a bonsai Japanese maple that turned yellow. She counted fifty empty pupa cases and the soil appeared to be greasy wet, caused by the activity of the maggots. A large number of crane fly larvae in one location was a good indication of poor drainage and too much water.